GEN3 Electric (215) 352-5963: Continuing the Tradition of Giving Back to our Community with GEN4! Continuing the Tradition of Giving Back to our Community with GEN4! 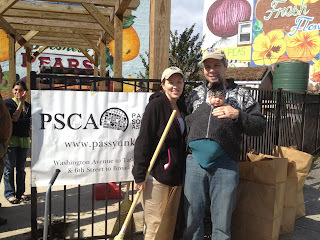 The Passyunk Square Civic Association participated in the City’s annual Spring Clean-Up event, Saturday April 14th. GEN3 Electric was there again to help the community: sweep up street trash and recyclables, remove impacted leaves and debris from gutters and drains, pull grass and weeds, and distribute recycling bins. Owners of GEN3, residents and PSCA members, Bill and Debbie Lutz were on-site supporting the clean-up efforts but, more importantly, teaching their daughter, Baby Rose, how important it is to get out with her neighbors to make Philadelphia beautiful! GEN3 Electric is Philly’s friendly neighborhood electricians, always eager to share information with other Philadelphia homeowners on how to update the electrical wiring in older homes and give energy efficient home improvement ideas. Everyone at GEN3 knows that giving a little back to the community will help keep the neighborhood thriving with happy residents and businesses alike.